Write MOM on the rough side of the corrugated board. Use a scissors and cut the word out. 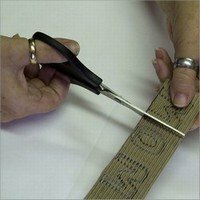 (Make sure to measure the board against the heart before writing). 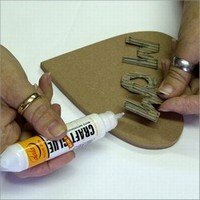 Use the Dala Craft Glue stick to adhere the cut out letters to the heart. Allow to dry slightly. 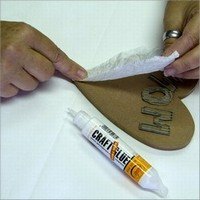 Cover the entire surface of the heart as well as the letters with Dala Craft Glue stick. Crinkle the tissue paper into a ball, open up and stick over the entire heart. (Make sure you have a lot of creases in the tissue paper) Stick the paper onto the edges of the heart. Paint the whole heart with Dala Plum Craft Paint. Allow to dry thoroughly. (You can use a hairdryer to dry the paint). With a clean brush use a bit of white to dry brush the tissue paper. (For dry brushing, make sure there is only a bit of paint on the brush. 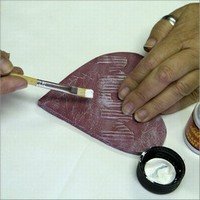 You can take a bit off by painting the white on a piece of newspaper of roller towel) This technique is exactly what it says, you need to have a dry brush with paint otherwise if there is too much paint it will just cover the plum colour. Brush lightly over the tissue paper. 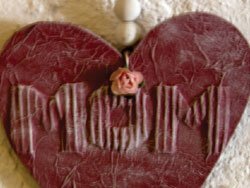 Thread some string and beads on your heart with a flower or two and give this special gift to your mom for Mothers day. This item has 765 views.